Indie Retro News: The Summer of 64 - RGDS Podcast and Indie Retro News latest Amiga album! The Summer of 64 - RGDS Podcast and Indie Retro News latest Amiga album! 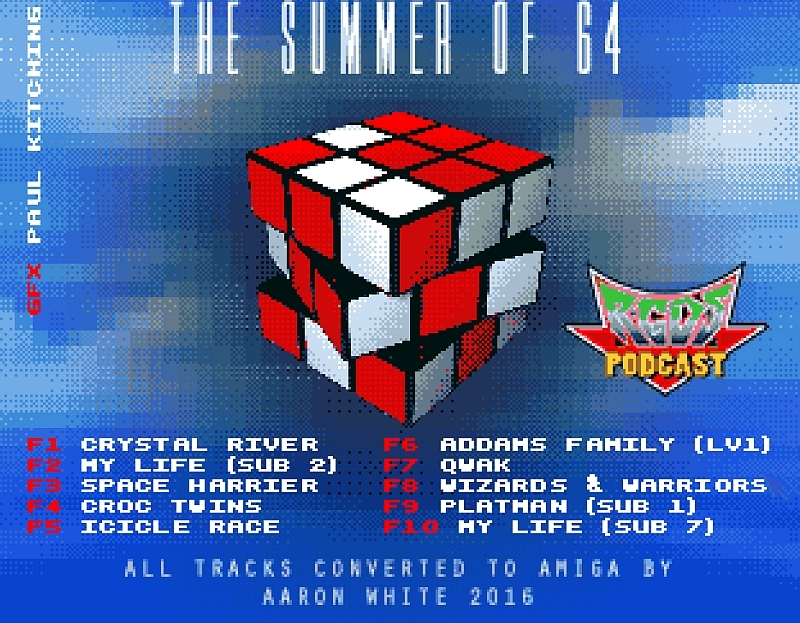 It's that late hour news article again, and this time it's all about Aaron White of RGDS Podcast latest musical wonder, ' The Summer of 64 ' for the Amiga! As an exclusive Indie Retro News release, with a number of tracks chosen by yours truly, this big special album with all tracks converted by Aaron, has a menu graphics loading screen by none other than Paul Kitchen, who is a good friend of Aaron's from way back (Amiga group CMAP) ,and is now working on the Viva Amiga film project doing graphics as well as a few other projects. This brilliant album The Summer of 64, is available as a freely downloadable ADF file, ready to be played via emulation, copied over to a floppy or used via a gotek. It features a wicked amount of converted tracks that sound fab with whatever sound system you prefer. Tracks such as Crystal River, My Life (Sub 2), Space Harrier, Croc Twins, Icicle Race, Addams Family, QWAK, Wizards & Warriors, Platman (Sub 1) and My Life (Sub 7). That's 10 converted tunes, you'll be listening to again and again.